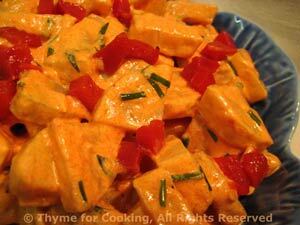 Pimiento Potato Salad, Thyme for Cooking summer sides. Pimientos or pimentos are similar to roasted red peppers. They are a heart-shaped red pepper that is a bit more flavorful and spicier than a red bell pepper. They are almost always found, roasted and peeled, in jars. Use whole if you can, or strips. Substitute roasted red peppers if you can't find the pimientos. You can use more for a stronger dressing. Slice potatoes into small pieces, for salad. Cook in boiling, salted water, partially covered, until done, 12 - 15 minutes. When done, drain, toss a bit to cool, and put into serving dish. Add dressing and stir gently to coat. Serve. Put pimento and yogurt into a blender and purée.